With the Yule drawing near, it is a good time to think upon and honor Odin, the Lord of the Hunt and the Jolnir. Today, I am very excited to have a chance to share my watercolor version of Meredyth's artwork of Odin. The original has long been one of my favorite pictures of the All-Father. I really feel that the artist caught a wonderful glimpse into the God's spirit with his striking work. When I first felt the push to set up a little shrine to Odin, that was the picture that went up. No other image would do: that particular piece was the one that truly resonated with me. Back then, my altars were in their early, rough stages. For a polytheist, the availability of shelf space can at times become a cheerful conundrum, but that was not yet the case for me. One night, though, my fulltrui's presence was particularly strong, and He urged me to make some major changes to my shrines, including His own. As for Odin's--well, Odin's picture was too small. So I printed out a larger version of Meredyth's original black-and-white artwork and framed it. I did long for some color, however, and decided to try out my watercolors on the picture, since it was only for use on a private altar. The painted version has been up in my home for a while now. Meredyth has very kindly given me permission to share my watercolor version of his original work. I have done a bit of re-balancing with my art software and am very pleased to be able to share this image of Odin now, at this time of the year. 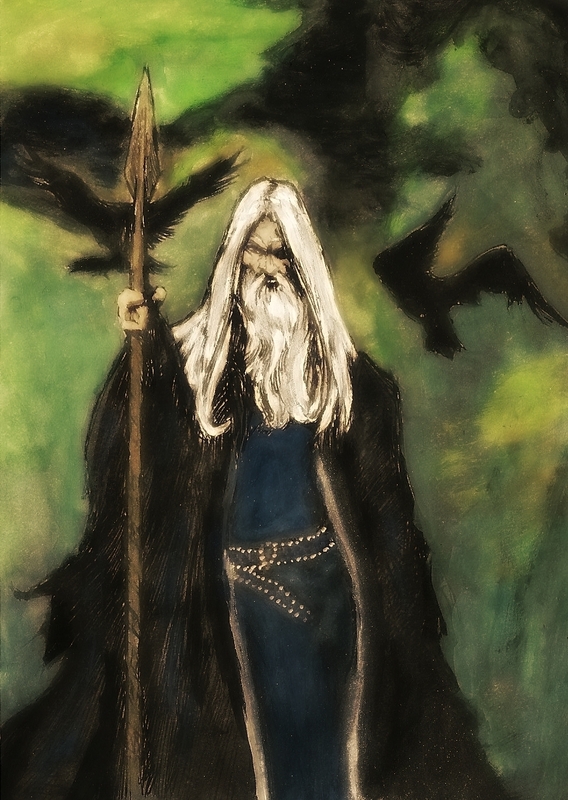 Watercolor Version of "Odin by Meredyth"
I don't know how I missed this before, but I'm just now seeing it. Awesome! Thank you! Well, for the watercoloring part. Meredyth does incredible work.